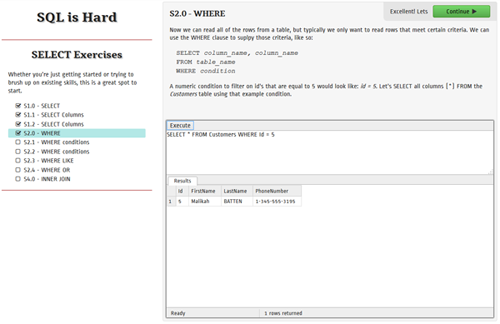 Several years ago, I launched SQLisHard to help folks learn SQL. Some folks learn well from books or videos, but others learn best by getting in there and running queries. I monitored and tweaked things for about a year, trying to get the first set of exercises smoothed out. Then, like many folks, I was sidetracked by other projects and work responsibilities. For about $10/month, this little site has kept running and helping folks. I expected to see traffic die off, since I wasn’t adding more content. Instead, there’s been nearly 7000 folks that have stopped by and successfully completed one or more exercises despite a total lack of marketing. The hosting is oversized for what it is, most of the technology is not what I would pick today for options, but it just keeps ticking. So I’m dusting off the build pipeline, rebuilding some data analytics so I can see what’s going on, and started fashioning a new set of exercises. Here’s how I went about reviving the application. One of the things that made it easy to tinker with SQLisHard is the build pipeline for delivering updates. Most of the scripts live in the repo, but I hadn’t bothered to document it. Luckily, I had an old backup of the original build server VM and was able to recreate the build process on a much newer one. It was a little painful to bring back to life, but infinitely safer then applying changes manually. It’s past time for every company to run a pipeline, and I’m more than happy to dive into more details or other build services if folks are interested. The 2013 version of SQL is Hard tracked statistics on how many folks were successful or unsuccessful at each step along the way. Visibility into the flow from step to step helped me make adjustments and help folks make it all the way through the exercises. This site used a bunch of experimental things, so the data originally lived in a beta Splunk Cloud offering that was discontinued years ago (and replaced by a cloud offering that did not have an API…). Unfortunately, this activity is not tracked well in the database either. Where this pays off is when I start making new exercises public. Now I’ll have immediate visibility into how folks are progressing and I can try to improve the exercise descriptions to help as many folks get through as I can. The first exercise set focused on some basic building block SELECT statements. We went through some beginning SELECT * statements, listed columns, and column aliases. We performed WHERE statements with equivalence, LIKE, and BETWEEN. Then we added in JOINs with ON statements. If this works out, I’ll have a test link posted on twitter (@sqlishard) and, after a trial period, will roll it out live. I can’t promise this will usher in a great deal of additions, it’s hard to jump in this code base and not immediately start rewriting all the things plus I have a half-dozen other projects I’d like to be working on too. We’ll see what happens.